Since joint distraction in places such as the jaw and maxilla may work so too may it work in other regions. Atlantoaxial joint distraction for treatment of basilar invagination secondary to rheumatoid arthritis. "We present our experience of treating two cases of rheumatoid arthritis involving the craniovertebral junction and having marked basilar invagination by an alternative treatment method. In both the cases, the facets were osteoporotic and were not suitable for screw implantation. The patients were 66 and 72 years of age and both patients were females. Both the patients presented with complaints of progressively increasing spastic quadriparesis. Surgery involved attempts to reduce the basilar invagination and restore the height of the 'collapsed' lateral mass by manual distraction of the facets of the atlas and axis and forced impaction of titanium spacers in the joint in addition to bone graft harvested from the iliac crest. The procedure also provided stabilization of the region. No other fixation procedure involving wires, screws, plate and rods was carried out simultaneously. Following surgery both the patients showed symptomatic improvement and partial restoration of craniovertebral alignments. Follow-up is of 2 and 24 months. 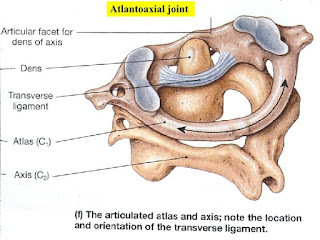 Distraction of the facets of atlas and axis and impaction of metal implant and bone graft in the facet joint can assist in reduction of basilar invagination and fixation of the region in selected cases of rheumatoid arthritis involving the craniovertebral junction." Evidence of cartilage repair by joint distraction in a canine model of osteoarthritis. https://onlinelibrary.wiley.com/doi/full/10.1002/art.38906"Knee osteoarthritis (OA) is a degenerative joint disorder characterized by cartilage, bone, and synovial tissue changes that lead to pain and functional impairment. Joint distraction is a treatment that provides long-term improvement in pain and function accompanied by cartilage repair, as evaluated indirectly by imaging studies and measurement of biochemical markers. The purpose of this study was to evaluate cartilage tissue repair directly by histologic and biochemical assessments after joint distraction treatment. In 27 dogs, OA was induced in the right knee joint (groove model; surgical damage to the femoral cartilage). After 10 weeks of OA development, the animals were randomized to 1 of 3 groups. Two groups were fitted with an external fixator, which they wore for a subsequent 10 weeks (one group with and one without joint distraction), and the third group had no external fixation (OA control group). Pain/function was studied by force plate analysis. Cartilage integrity and chondrocyte activity of the surgically untouched tibial plateaus were analyzed 25 weeks after removal of the fixator. Changes in force plate analysis values between the different treatment groups were not conclusive. Features of OA were present in the OA control group, in contrast to the generally less severe damage after joint distraction. Those treated with joint distraction had lower macroscopic and histologic damage scores, higher proteoglycan content, better retention of newly formed proteoglycans, and less collagen damage. In the fixator group without distraction, similarly diminished joint damage was found, although it was less pronounced. 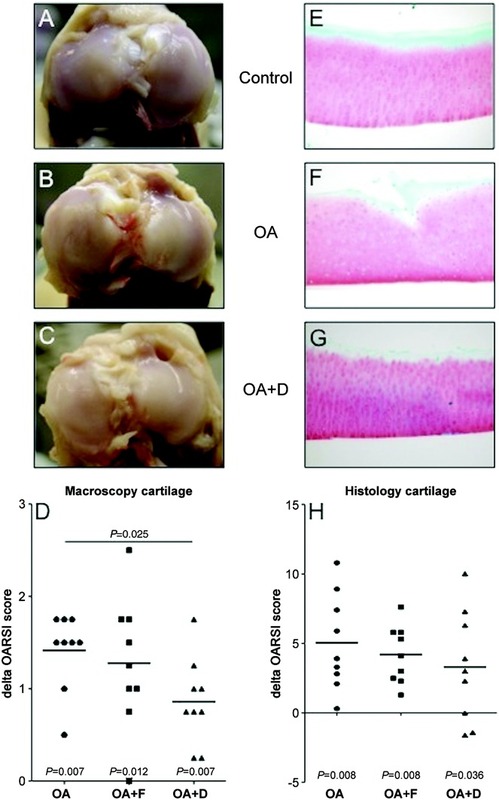 Joint distraction as a treatment of experimentally induced OA results in cartilage repair activity, which corroborates the structural observations of cartilage repair indicated by surrogate markers in humans." "Knee joint distraction is a surgical procedure by which the two bony ends of a joint and, with those, the cartilage surfaces are gradually separated to a certain extent (∼5 mm) for a given period of time (6–8 weeks) by use of an external fixation frame. " "The (transient) distraction results in a decrease in wear and tear of the cartilage surfaces. 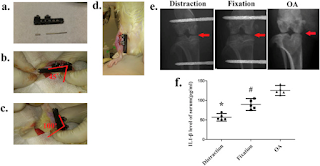 Furthermore, it results in intermittent fluid pressure changes during loading and unloading of the distracted joint (due to springs and flexibility in the distraction frame)"
Distraction does seem to make the cartilage more similar to that undergoing endochondral ossification. Joint distraction attenuates osteoarthritis by reducing secondary inflammation, cartilage degeneration and subchondral bone aberrant change. 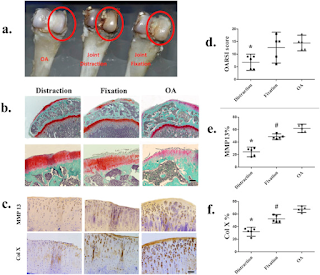 "Joint distraction reduced the level of secondary inflammation, cartilage degeneration and subchondral bone aberrant change, joint distraction may be a strategy for slowing OA progression."